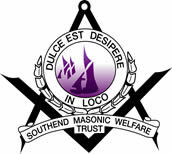 The Southend & Essex Masonic Welfare Trust is a registered charity (No. 266577) and an important feature of the objectives of the Trusst is the supply on loan free of charge, equipment to aid the recovery of those suffering from illness or recuperating from surgery. This service is available to all Freemasons and their families in the Province of Essex. The Trust operates a Careline Emergency Telephone Service. For further information and detail call the number below. The main distribution point for all equipment is the Masonic Centre at Saxon Hall, Aviation Way, Southend-on-Sea, SS2 6UN. The contact number for enquiries and collection is 07732 378656. The Trust now has equipment local distribution points all over Essex, where limited equipment (typically manual wheelchairs and 3 wheeled walkers). For Colchester, Manningtree, Brightlingsea and Mersea Island only contact Paul Masters: Tel: Col. 520485.